The Three Lions face the Netherlands in June's Nations League last four, with the winners then meeting either Portugal or Switzerland in the final. "To have a chance to win a trophy in an England shirt does not happen not very often," said the Tottenham striker. "If we win that trophy, in my eyes, it's a better year than 2018." England won the World Cup in 1966 - their only major international trophy - and have a chance of winning the first Nations League tournament after finishing top of a qualifying group that also included 2010 world champions Spain and 2018 runners-up Croatia. Kane, who won the golden boot for being the tournament's top scorer with six goals, added: "Hopefully, we can win some silverware. Of course, 2018 was fantastic but for me, the main thing is the team and we want to win things. We want to make fans happy and be proud. "People now expect us to do well and before the World Cup there was no expectation, so it's great that we've turned that around. "We're the only team from the World Cup semi-finals to have got through their Nations League group, and we had probably one of the hardest groups. "That was big for us, to prove that it wasn't just a one-off, that this team were really building for something special." 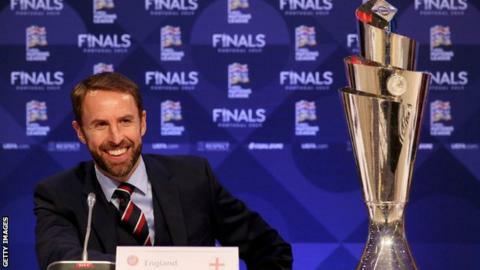 Before England play the Nations League semi-finals, they have their first two 2020 European Championship qualifiers - against the Czech Republic at Wembley on Friday and then away in Montenegro on Monday, 25 March. "He has been great over the last couple of days," said Kane. "We're excited to have him. Everyone is fighting for places and he sees this as an opportunity for himself." He described his week as being "a crazy experience" but Kane has been impressed with the player after lining up against him in the semi-finals of the Carabao Cup in January. "We played against him in the cup and he put in a good performance - that was the first time I'd seen him play. He looks sharp and hungry," added Kane. "The youth are not scared of expressing themselves and trying to score goals and that's what we want to have - that flair and flexibility - and it's a great sign in this country that we are producing these type of players. "Callum has had a taste of cup competitions, a little bit in the Premier League and I'm sure he wants to play and gain that experience. Everyone knows he is a fantastic player and I've no doubt he has the ability to play at the highest level." Friday's match could also see an England debut for West Ham defensive midfielder Declan Rice, who opted to play for the Three Lions despite making three non-competitive appearances for the Republic of Ireland. "I'm sure it was a tough one for him, and I'm sure he took the time to talk with his family and close friends," said Kane of the 20-year-old's choice. "The decision he made is one he thinks is best for his future. He will give everything for this country and that's what we want. "The thing I like about him is, as a defensive midfielder, he looks to play forward as quickly as possible. It's easy to play side-to-side but with Declan his first thought is to go forward - I'm a big fan of him." He said: "My nan and grandad were Irish on my dad's side of the family so I had that decision, but it never came about as I started playing in the Premier League and the England call-up came not long after that. "There were always rumours but I never said 'no' to anyone. I don't know if they spoke to my agent but I always wanted to play for England and that was my dream. Thankfully that worked out." "It's a great incentive and the opportunity to play in a European Championship where quite a few games are at Wembley is exciting and gives us a real hunger to qualify," added Kane, whose England side will also play qualifying matches against Bulgaria and Kosovo. "People expect us to qualify and they think it's an easy group but it's never that easy and we have to be professional. We always back ourselves but we still have to do it - it's important we start well and then we can build on that. "It's going to be a tough game against the Czech Republic. We have to get off to a good start and we've spoken about starting off the competition well. Their great strength is their unity, how they work without the ball."